View the EK Vector here! The EK Vector high-performance water block is specially designed for multiple NVIDIA® GeForce® RTX Turing based graphics cards. The water block itself uses the signature EK® single slot slim look, and it covers the entire PCB length. This sophisticated cooling solution will transform your beefy graphics card into a minimalistic, elegant piece of hardware. The block also features a unique aesthetic cover over the block Terminal which is designed to reveal the graphics card model, visible from the side. This water block is compatible with all reference design GeForce RTX 20×0 based graphics cards, but as always, we recommend that you refer to the EK® Cooling Configurator for a precise compatibility match. The EK Vector Series water blocks use an Open Split-Flow cooling engine design which proved to be a superior solution for GPU water blocks. It is characterized by low hydraulic flow restriction, which means that it can be used with weaker water pumps, or pumps running on low-speed settings and still achieve top performance. The jet plate and fin structure geometry have been optimized to provide even flow distribution with minimal losses and optimal performances even when used in reversed water flow scenarios. G1/4″ threaded fittings can be used on both sides of the terminal and for multiple GPU connectivity, please refer to our offer of GPU Terminals. The EK-Vector GPU water block terminal cover is not compatible with FC Terminal X and FC Terminal (Legacy) multi GPU connectivity bridges. While browsing through social media, we ran across this little gem, which looks to be an upcoming water block for the ASUS Strix GTX 980 from Thermaltake Technology INC. WIth the Launch of the Thermaltake Pacific Series water cooling products, showcased at CES 2015 in Las Vegas, we are pleasantly surprised to see Thermaltake launch into, not just CPU water block market, but also the Graphics card water block market. With what we have seen from Thermaltake in the last few years, we are happy to see the company moving into these avenues. 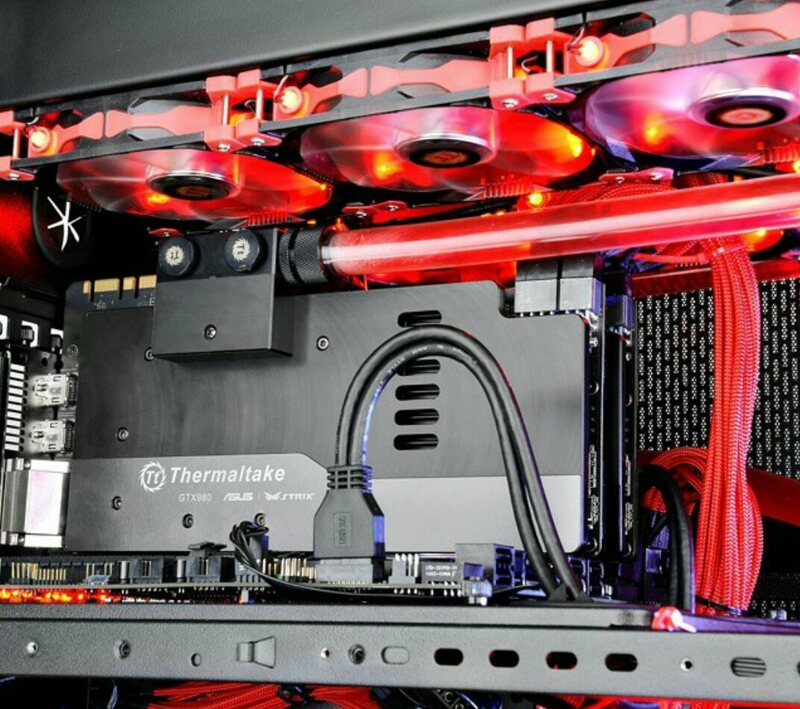 For more information on the Thermaltake Pacific Series water cooling products please visit Thermaltake’s Website and as always make sure to follow them on all of their social media channels. For more news make sure to follow us. Precision Computing – Technology Refined.